Are you getting a little tired of the machismo-driven skyscraper sandwich trend? 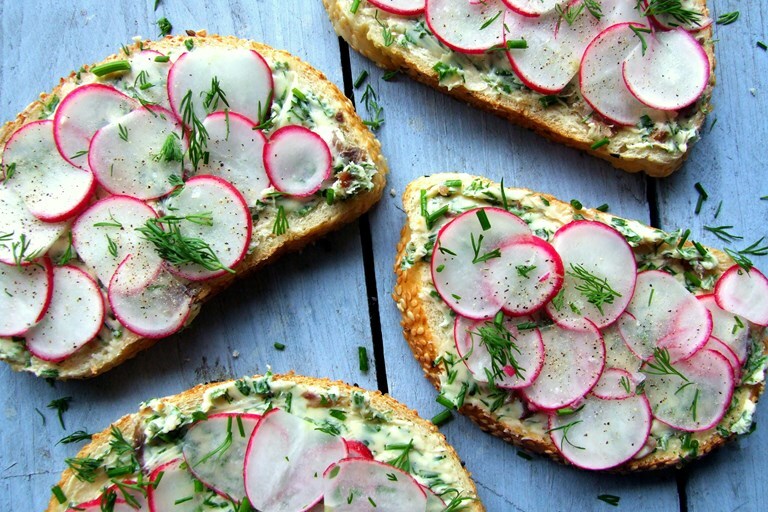 Helen Graves encourages us to step back and enjoy the simpler things in life with this glorious radish sandwich recipe, paired with an anchovy butter for the perfect umami finish. The reign of the sloppy joe might just be over. It’s all getting a little bit out of hand; a little bit …dare I say it, gross. Vulgar, even. Why is it that we seem to have started a game of sandwich trumps, the winner determined by the amount of different meats and fat they can ram between two pieces of bread? There is a lot to be said for clean and simple pleasures and I invite you to enjoy some in the form of delicate vegetable sandwiches. What? Now come on, bear with me; especially you at the back with the meat sweats. Lots of vegetables will work in a sandwich like this; try thinly slicing young courgettes, topping with feta cheese, fresh red chilli and really good extra virgin olive oil. You could also replace the courgette with that summer classic, the trusty cucumber. And what about the often over-looked tomato sandwich? It’s hard to beat if you can ever get your hands on a decent fruit. Easier said than done but we must remain hopeful. In the event that you do find one, take action quickly. Slice that fragrant orb and lay it down onto the freshest bread you’ve ever held in your hands, spread thickly with golden butter. Sprinkle the lot with flaky salt and a grind of pepper and then eat it, immediately. Be very serious about this last point; the tomato sandwich demands to be eaten as soon as it is made, or else one risks ending up with the saddest sandwich situation possible: soggy bread. My favourite sandwich in this genre however is this snazzy radish number. Make a very savoury butter by smooshing in a few fillets of anchovy and a mixture of herbs; I’ve used chives, dill and parsley, but tarragon or chervil would put a different and pleasant perspective on things. 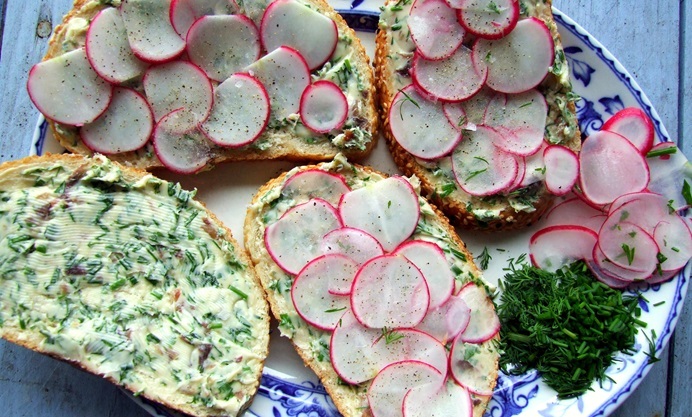 Spread it thickly on soft white bread and top with wafer-y slices of the perkiest radishes you can find. Top with a tinkle of flaky sea salt and some pepper. I think it’s one of the finest, freshest and prettiest sandwiches around, actually, and the antithesis of all that meat-mountain willy waving.